July has some scrumptious offerings, which are just as beautifully scented as those featured inside the June box. Each month The Melt Crowd will feature 8 Flamingo Candles Scent Melts, two of which are exclusive to The Melt Crowd box, alongside a menu which describes each scent, provides tips and tricks of how to use your scent melts as well as safety instructions and a handy discount code for 20% off at www.flamingocandles.co.uk. 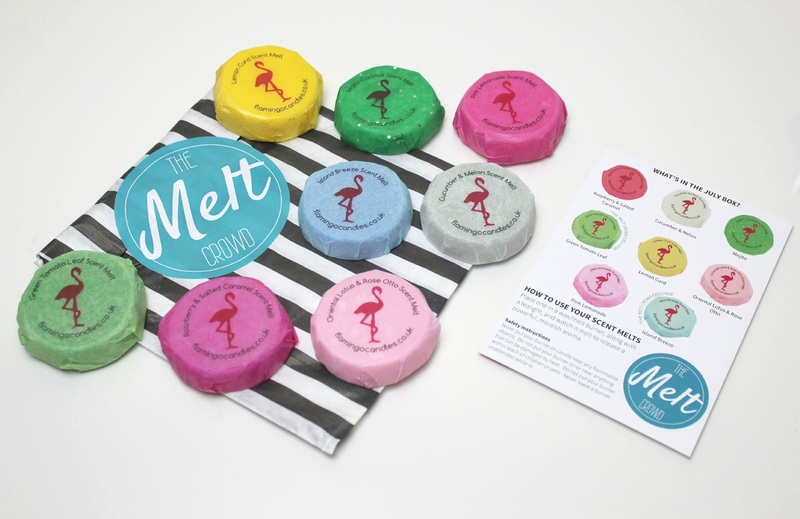 The 8 delicious scents inside the July box include Raspberry & Salted Caramel, Cucumber & Melon, Mojito, Lemon Curd, Oriental Lotus & Rose, Pink Lemonade, and the 2 The Melt Crowd exclusive scents, Green Tomato Leaf and Island Breeze. 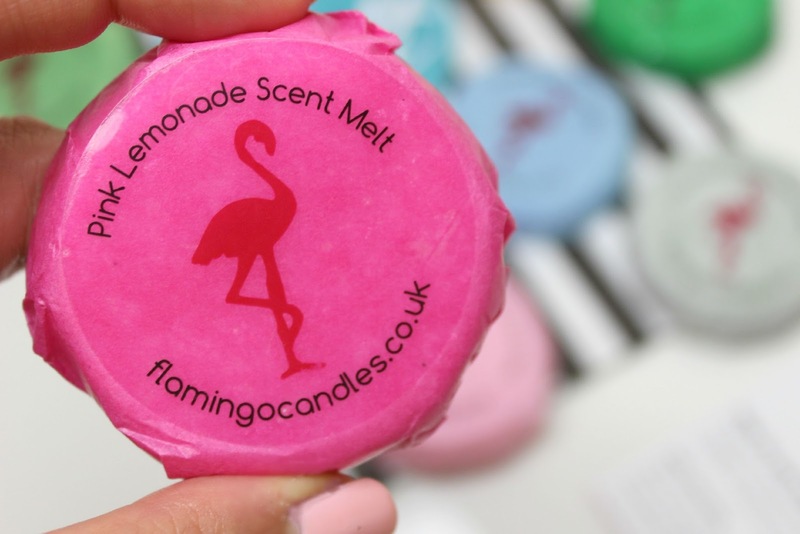 My favourite scents from the July box are definitely Pink Lemonade and the exclusive scent, Green Tomato Leaf. 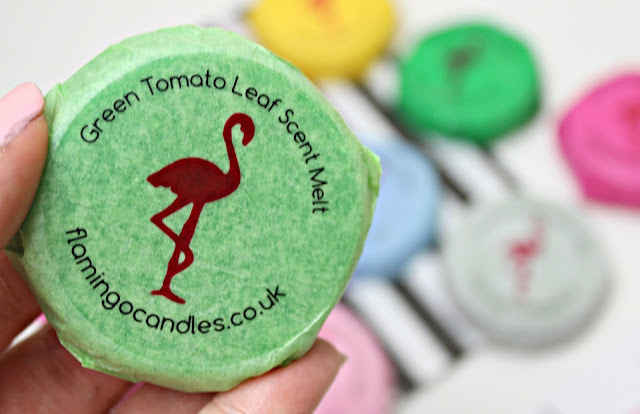 I was actually over the moon when I spotted Green Tomato Leaf because Jo Malone have a Green Tomato candle and it smells unbelievable, but I just can't justify the price - this is just as lovely and if it smells as delicious when in my burner, I am definitely going to be hoping Flamingo Candles create a full size jar candle in the same scent (hint hint, Flamingo Candles!). 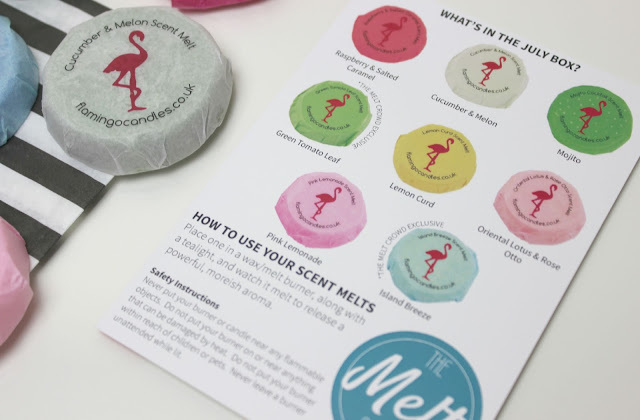 The Melt Crowd is a brand new monthly subscription box which costs £10 a month, including postage, and first time subscribers are even provided with a burner to use their scent melts in. Find out more and subscribe here. I was very disappointed to see that the 10 pounds didn`t include delivery which was actually quite expensive.